Step1. 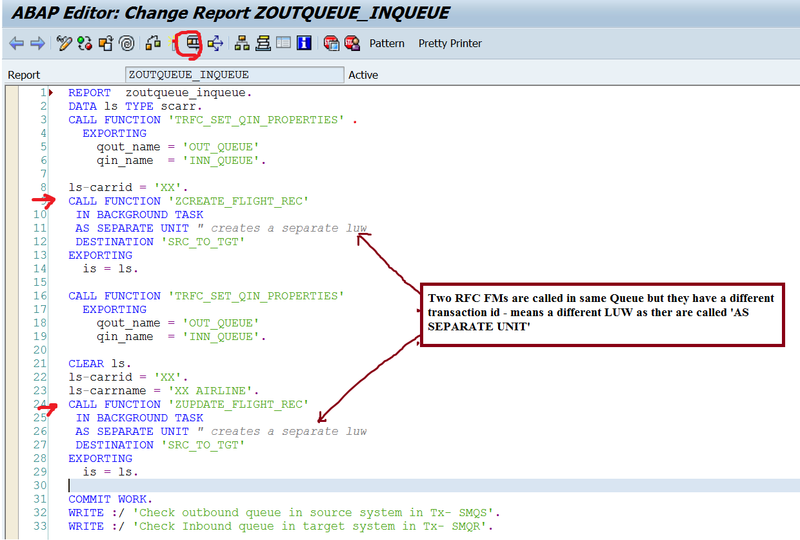 In single Queue- If we call multiple RFC FMs as separate unit then, for each FM call there is a separate TID – transaction Id means it is a separate LUW. Execute the report which calls two RFC FMs in separate unit . Step3. Source system – Tx- SMQS. Select the line and click on qRFC Monitor. Step4. Source system: Double click on out bound queue name. Step5. Source system : Double click on the OUT BOUND Queue name. Step6. Source system: So here we have TWO RFC FM calls and each is associated with a different TID. Process the out bound queue. Step7. Source system. TO process the queue register the RFC destination. Step8. Source system. Continue to proceed. Step9. Target system : Tx- SMQS. Select the line and click on the qRFC Monitor button. Step10. Target system : Double click on the Inbound Queue name. Step11. Target system : Again double click on the Queue name. Step12. A snap short of the comparison of the TIDs of the source system outbound queue and destination system inbound queues. See the next post where all FM calls are included in a single LUW.